There are always some options when customers choose the solar panels to match up their devices. The mostly popular types are Textured PET laminated and glossy PET laminated. The only difference between them is the coating material, other layers are exactly same, see drawings attached. Opinions from consumers and experienced engineer. "Texturing the surface of the PET coating will have very little effect on normal incident light rays, but will assist in absorbing the oblique angle rays. The disadvantage of texturing is that it makes it difficult to clean the solar panel. Dust particles get down into the valleys of the texture and are difficult to remove. A coating that is easy to scratch and difficult to clean is undesirable, so most solar panels do not use a textured coating PET." When you are using a permanently installed solar product like solar garden light, solar lawn light, solar barricade light, then we do not suggest use the textured PET solar panel. 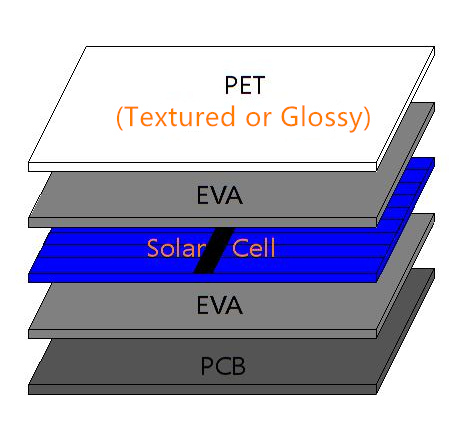 But if you are using a portable solar product like solar charger, solar power bank, solar camping light, solar flashlight etc then a textured PET solar panel is suggested.